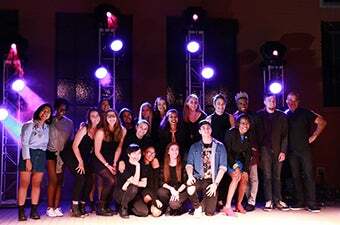 The ASU’s Got Talent live show is a one-night competition event featuring acts from across the university. Performers showcase their skills in singing, dancing, stand-up and more. The top act of the night walks away with a grand prize and bragging rights for an entire year. I come from Las Vegas, Nevada and I’ve been performing practically all my life. I’ve auditioned for shows like America’s Got Talent, The Voice, and La Voz Kids (Spanish version of the voice). I love to entertain people and I hope I can do that when I’m on stage for ASU’s got talent! AZNA Dance is an urban dance club/class at ASU that celebrates - but is not limited to - the Asian American community. Emma is originally from Minnesota and is a Journalism and Spanish student at the Downtown Campus. She's also a Barrett Honors student. Some fun facts about her: Emma is a twin, loves Chick-Fil-A, and she has what is known as Relative Pitch, which means that she can tell the key of a song in a matter of seconds! She is very passionate about music and she is beyond excited to perform for all of you! Mallie grew up in Arizona and has been a performer ever since she was little. She recently started working on an album and is very excited for her first single "Complicated" to come out. I am an artist from Brooklyn, New York. Hip-hop is what I'm very passionate about because of its ability to bring unity into communities through vocal expression. My style is very unique and brings nostalgia to many people who hear the sounds that are so profound. Brittany Tews is a singer/songwriter & multi-instrumentalist with a passion for country music. She is also a freshman on ASU's Polytechnic campus and is majoring in Engineering (Electrical Systems).